Based in downtown DeWitt, Madar Law Office is a premier multi-service law firm serving the entire Mid-Michigan area and beyond. We provide an array of superior legal services, from professional licensing defense, contract law and estate planning to family law, personal injury and drunk driving. 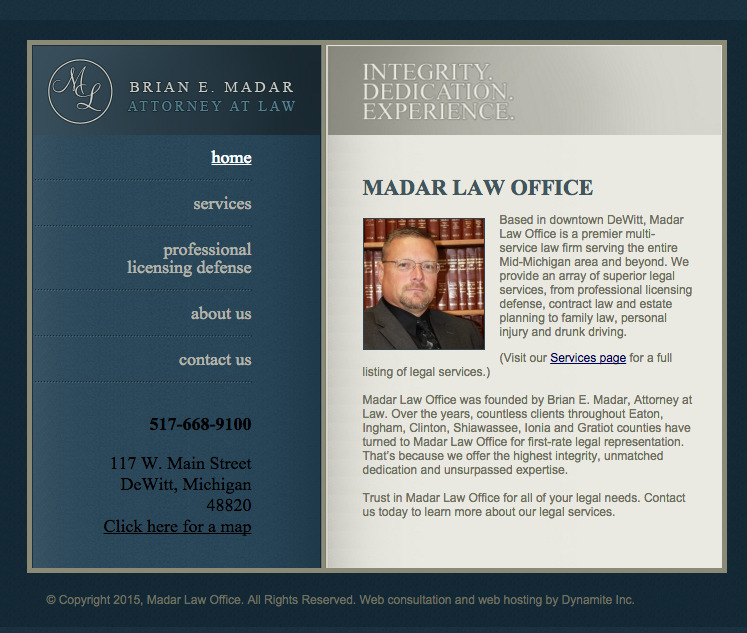 Madar Law Office was founded by Brian E. Madar, Attorney at Law. Over the years, countless clients throughout Eaton, Ingham, Clinton, Shiawassee, Ionia and Gratiot counties have turned to Madar Law Office for first-rate legal representation. That’s because we offer the highest integrity, unmatched dedication and unsurpassed expertise. Trust in Madar Law Office for all of your legal needs. Contact us today to learn more about our legal services.